Immunogen was a synthetic peptide, which represented a portion of human Lectin, Galactoside-binding 7 encoded within exon 4 (LocusLink ID 3963). 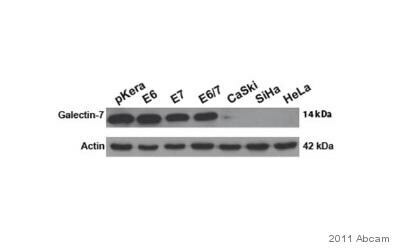 Modified RIPA extract from the epidermis of FVB wild-type or galectin 7 transgenic mice. Our Abpromise guarantee covers the use of ab10482 in the following tested applications. WB 1/10000 - 1/40000. Detects a band of approximately 14 kDa (predicted molecular weight: 16 kDa). IP Use at 10-20 µg/mg of lysate. Mainly expressed in stratified squamous epithelium. 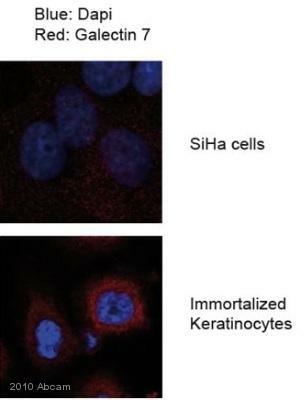 ab10482 staining Galectin7 in Human cervical tumor and immortalized keratinocytes by ICC/IF (Immunocytochemistry/immunofluorescence). Cells were fixed with paraformaldehyde, permeabilized with 0.25% Triton X-100/PBS and blocked with 1% BSA for 1 hourat 25°C. Samples were incubated with primary antibody (1/1000 in 1% BSA/PBS) for 24 hours at 4°C. 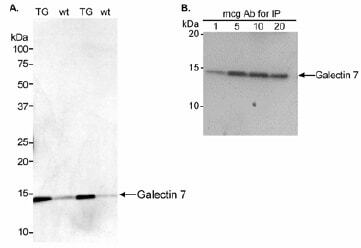 An Alexa Fluor®594-conjugated Goat anti-rabbit IgG polyclonal (1/2000) was used as the secondary antibody. IHC image of ab10482 staining in human Hodgkin's lymphoma formalin fixed paraffin embedded tissue section, performed on a Leica BondTM system using the standard protocol F. The section was pre-treated using heat mediated antigen retrieval with sodium citrate buffer (pH6, epitope retrieval solution 1) for 20 mins. The section was then incubated with ab10482, 5µg/ml, for 15 mins at room temperature and detected using an HRP conjugated compact polymer system. DAB was used as the chromogen. The section was then counterstained with haematoxylin and mounted with DPX. Publishing research using ab10482? Please let us know so that we can cite the reference in this datasheet. BATCH NUMBER 143110 ORDER NUMBER 127060 DESCRIPTION OF THE PROBLEM Multiple bands, same problem as question 1. Faint band detectable at 14 kD. Multiple stronger bands of higher molecular weight (250-37). SAMPLE lymfoblast cell lysate PRIMARY ANTIBODY 1/20000 dilution in 5% milk. Incubation time overnight. 3x 10 minutes washes. DETECTION METHOD ECL from Amersham POSITIVE AND NEGATIVE CONTROLS USED none ANTIBODY STORAGE CONDITIONS 4 SAMPLE PREPARATION I am using RIPA lysis buffer including protease/phosphatase inhibitors. I boil the sample for a standard 5 min at 95 degrees. AMOUNT OF PROTEIN LOADED 80 ug ELECTROPHORESIS/GEL CONDITIONS reducing gel 4-12% gradient gel TRANSFER AND BLOCKING CONDITIONS Transfer overnight. Blocking with 5% milk for 10 minutes. SECONDARY ANTIBODY 1/5000 dilution in TBS/Tween for 1 hour Goat-anti-Rabbit (Pierce). 4x 15 minutes washes. HOW MANY TIMES HAVE YOU TRIED THE APPLICATION? 2 HAVE YOU RUN A "NO PRIMARY" CONTROL? No DO YOU OBTAIN THE SAME RESULTS EVERY TIME? Yes ADDITIONAL NOTES In your example you use the antibody in a 1/200 and 1/400 dilution. Still you advice 1/10000 or 1/40000. Why? Thank you for your enquiry regarding ab10482 and for providing some further information. I am very sorry to hear that you are having some problem with this antibody. I understand from your e-mail that you used lymfoblast cell lysate. Can you please specify the species? Blocking is very important step and the time and the temperature is crucial. Normally I suggest blocking the membrane at least for 1 hr at 4oC – it seems that 10 min is too short. For further information on blocking and Western blot, please visit our website at: https://www.abcam.com/index.html?pageconfig=resource&rid=10413 https://www.abcam.com/assets/pdf/protocols/WB-beginner.pdf Have you tried to use 5% BSA for blocking instead of milk? Milk sometimes can produce non-specific bands on the blot and in our lab we usually use BSA for blocking. I would also recommend testing the secondary antibody alone i.e. run a no primary control to see if the non-specific bands are due to the secondary antibody or not. I hope this will help. 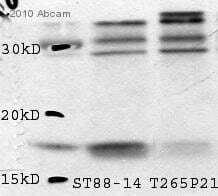 Should you still have problem with this antibody, then please do not hesitate to contact me again. Thank you for your enquiry and your patience. Here we are forwarding the protocol for Preparation of Epidermal Lysates: Transgenic and nontransgenic mice were killed by cervical dislocation. The dorsal skins were treated with a depilatory agent (1 min) followed by washing. The skin was excised, and the epidermis was scraped off with a razor blade into lysis buffer [50 mm Tris (pH 7.4), 1% Triton X-100, 150 mM NaCl, 1 mM EDTA, 1 mM PMSF, 1 mM Na3VO4, 1 mM NaF, and 1 ug/ml each of aprotinin, leupeptin, and pepstatin]. The lysates were homogenized using a needle (18-gauge) and syringe and were centrifuged at 14,000 x g for 15 min at 4°C. The supernatant was used immediately for Western blot analysis. We hope this information will be useful for you. If you need anything further or any help then please let us know.